Earlier this month it was revealed that, after having rolled out the Android 5.1 Lollipop update, Google is already working on Android 5.1.1. A reference to the new build was spotted in the Android SDK manager, so we argued that the new version shouldn’t take long to become available. Now the new build has been spotted on Google’s own Android audio latency info page running on the Nexus 7 and Nexus 9 (as seen at Android Police). While the Android 5.1 update is available for some Nexus devices, the Nexus 9 has Android 5.0.1 running on it and the Nexus 7 benefits from the services of Android 5.0.2 Lollipop. For those frustrated that their Nexus tablets aren’t rocking Android, the good news that comes today is that Google is planning to update both tablets to Android 5.1.1 directly. 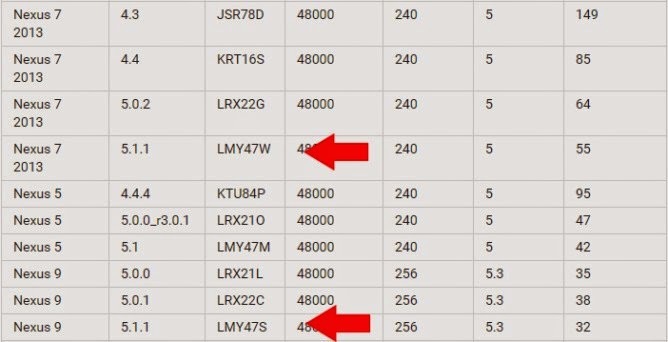 The build number for the Android 5.1.1 Lollipop update will be LMY57W for the Nexus 7 2013, whereas the Nexus 9 will be updated to LMY47S. For the time being, we don’t have any information on what Android 5.1.1 might be bringing to the table, compared to Android 5.1, although the jump seems to be a fairly small one. So most likely, we’re going to see some bugs being squashed. Hopefully, the pesky memory leak one will finally get the boot too.